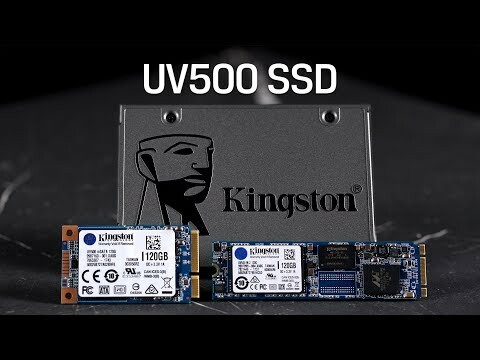 Kingston’s UV500 family of solid-state drives dramatically improves the responsiveness of your existing system with incredible boot, loading and transfer times compared to mechanical hard drives. Powered by a Marvell 88SS1074 controller combined with 3D NAND Flash for read and write speeds up to 520MB/s and 500MB/s, this SSD is 10X faster than a traditional hard drive for better performance, ultra-responsive multi-tasking and an overall faster system. UV500 provides end-to-end data protection, supports 256-bit AES hardware-based encryption and TCG Opal 2.0 security management solutions. UV500 is available in multiple capacities from 120GB–1.92TB, so you can buy one to use as a boot drive, or take advantage of the larger capacities to store videos, photos and host your most frequently used applications. • 10X faster than a 7200RPM hard drive. • AES 256-bit Hardware Encryption: Self-Encrypting Drive (SED) and TCG Opal 2.0. • Available in multiple form factors (2.5”/M.2/mSATA). • Multiple capacities up to 1.92TB. Features • Ideal for Desktops and Notebooks: Comes in multiple form factors (2.5”/M.2/mSATA) to fit in a wider array of systems. It is ideal for slimmer notebooks and systems with limited space. • Multiple Capacities: Available in a range of capacities up to 1.92TB to meet your data storage requirements. • Encrypted Protection: Protect sensitive data with support for 256-bit AES hardware-based encryption and TCG Opal 2.0. • 10X Faster Than A Hard Drive: With incredible read/write speeds, the UV500 will not only increase performance, but can also breathe new life into older systems.